Parsifal is a controversial work that lends itself to a multiplicity of interpretations. Wagner had drawn on a wealth of cultural and historical influences, primarily Christian and Arthurian myths, to create this sweeping opera. Hans-Jürgen Syberberg does the same and provides provocative imagery in adapting the opera for the screen. The result is a masterpiece of conflicting emotional, ideological, and spiritual states. While certainly not an easy viewing experience (clocking in at a little under four and a half hours), the film provides vivid imagery and a dynamic cinematic experience for all who allow themselves to be swept up by it. Parsifal was Wagner’s last opera and perhaps his most ambitious. Joseph Goebbels and Adolph Hitler, whose association with Wagner’s work is infamous, banned the performance of the opera in 1939. There has been much controversial discussion as to why Hitler and Goebbels imposed this ban. Some argue that the opera’s message of pacifism and its promotion of the Christian ideal of suffering ran counter to the ideologies of the Third Reich. Syberberg has referred to Hitler as “the bitter flower of German irrationalism”, and much of the film version of Parsifal, like much of Syberberg’s work, is intent on exploring the romantic and irrational in German history and culture, aspects or ideas which had been demonised in the aftermath of the Third Reich (1). As well as being a fascinating instance of Syberberg’s cultural criticism, the film is also interesting stylistically. It is, at times, extraordinarily trying because of its overly meticulous attention to detail, as well as its cautious pacing. However, Wagner’s work is vast and sweeping, and Syberberg stays true to the composer’s vision. The director provides a faithful adaptation of the opera to the screen, while using various cinematic and theatrical techniques to find relevance and universality in the work. For example, he uses marionettes, superimpositions, and images of historical events to give the film greater depth. Syberberg’s film may be the most elaborately executed filmed opera in cinematic history. The sinuous plot of Wagner’s source focuses on King Amfortas, leader of the Knights of the Grail, who has been wounded in battle by the very spear that had pierced Christ’s side. No medicine can heal the wound. Amfortas sends a young man, Parsifal, who had thoughtlessly killed a swan, to retrieve the spear from Klingsor, a dark magician banned from the kingdom, who uses his garden of pleasures to seduce anyone trying to retrieve the spear. Syberberg’s approach is surreal in its design. The film operates on many different levels by using the camera as a tool to extract meaning. 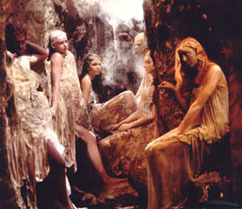 The film suggests and promotes other allegorical meanings in addition to the already symbolic elements of the Grail legend, by placing it in a contemporary context through the use of allusion and recurring motifs. The Christian messages of compassion and redemption are evident in the film, as they are in the opera, and ultimately, timeless questions about faith and suffering are asked. There is also a Brechtian aesthetic that is at work in the film. Syberberg’s approach seems to make the film a form of meta-theatre, wherein some of the obtrusive elements of the filmmaking process call attention to themselves. This is done to consciously provoke the viewer into reevaluating his or her relationship to the material. What is most interesting about Parsifal is its combination of historical and cultural elements and Syberberg’s use of different mediums to tell the story. Syberberg brings Wagner’s masterful re-imagining of the Grail legend to another place all together. He does remain faithful to elements that comprised Wagner’s opera, but Syberberg’s film has its own identity. Parsifal is, in keeping with the director’s style, highly idiosyncratic. However, the film is an ambitious achievement, and a fitting representation of both Wagner’s work and Syberberg’s vision. Derrick Everett, Monsalvat: The Parsifal Home Page, 24 July 2003. Bill Blick is an Assistant Professor and Librarian at Queensborough Community College of the City University of New York. He has published work and presented on film, popular culture, librarianship, and literature in many different venues, and has previously published CTEQ Annotations and Key Moments in Australian Cinema for Senses of Cinema.